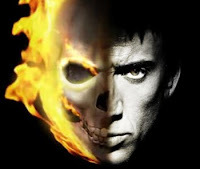 Bloody Disgusting has confirmed that Columbia Pictures is officially out to screenwriters for Ghost Rider 2, and star Nicolas Cage is already signed on to reprise the role as Johnny Blaze. This is shocking because nobody I know enjoyed the 2007 film when it was released. In fact, the Internet Movie Database user rating is a 5.3 (which is somewhere between bad and very bad) and a 28% on the Rotten Tomatoes critics-rated Tomatometer. The film didn’t even make big bucks at the box office. Made for $110 million, the film grossed $228 million worldwide (again, about half of which went to exhibitor costs) which means the film barely made a theatrical profit. But for a superhero movie like Ghost Rider, the real money is made in merchandising and DVD sales, which explains the interest in a sequel. I use to read Ghost Rider comic books when I was younger, and I really believe that the comic property could be turned into a pretty cool movie. Lets just hope that Mark Steven Johnson isn’t sitting in the director’s chair this time around. Sony needs to learn from Marvel’s recent wins and hire a director who is a few levels higher than the material.